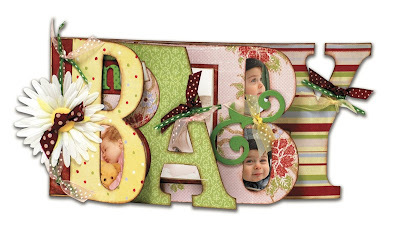 1) The Cricut Baby Bug or standard Cricut (shown above): It cuts paper sized from 6"x12" and smaller into shapes and letters using the Cricut cartridges. The smallest font size it will cut is 1" and largest is 5.5" and the longest it will cut is 11.5". It weighs around 7 lbs and is very portable. Typically, you can find these new on sale for as low as $99 (Joann's this weekend) up to $184 and they usually come with two cartridges called George and Basic Shapes. You can find used machines on craigslist and ebay for around $100, but usually they do not include any cartridges. Start looking this week because lots of people just upgraded to the Expression and will be looking to sell their machines. 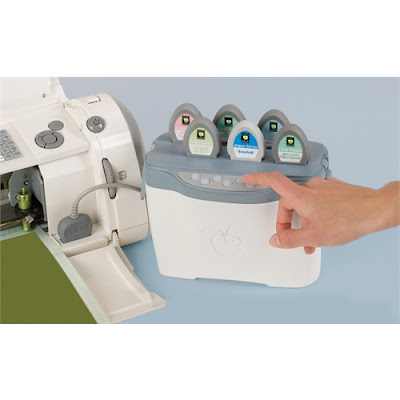 2) The Cricut Create machine, above, is about the same size as the Baby Bug but has some versatility. It retails at $299 but can be found for much cheaper. According to the cricut.com website, here are some of the differences:It allows cuts from 0.25" up to 11.5" on a 6" x 12" cutting mat. 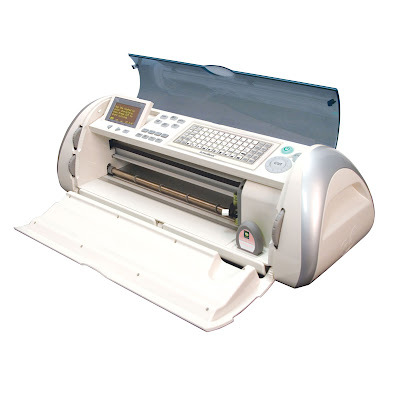 The machine also includes an eight-way directional blade, Portrait mode (to cut taller images), Fit to Page mode (to cut the largest cut possible), Auto Fill mode (to mass produce cuts), Center Point function, and Flip function. An improved display screen and sleek design add greater style and convenience. So, basically, you can cut fonts smaller and use some of the functions to make multiple cuts of the same thing easier through autofill. This has a higher price point, is found usually only at Michaels, and comes with the Don Juan font and a shape cartridge. 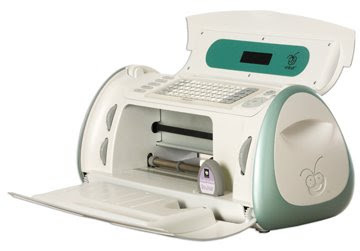 3) The Cricut Expression, above, is much larger and more expensive than the other two machines. This weekend, it was on sale for $199 at Walmart but is listed at retail at Michaels for as high as $399. Shop around for the best price, as there is a wide variance. It accommodates paper sized 12"x24" (if you purchase a longer mat, sold separately). It comes with a 12"x12" mat. The main differences between this and the smaller cricuts are the ability to use different creative features within one cut (i.e. one letter of one style, the next of another style, etc.) and the ability to make very large cuts by using the 12"x24" mat. Also, the Expression comes with an LCD screen so you can see exactly what is going to cut before the cutting begins, a huge bonus! It comes with Plantin' Schoolbook and Accent Essentials cartridges. It is not very portable, as an FYI. After you purchase your Cricut, I highly recommend watching the videos on how to use them. For the regular Cricut, watch Introduction, BasIc Training, and Advanced Training. There are also Maintenance and Design Studio videos. For the Cricut Expression, watch Intro, Training One, and Training Two. 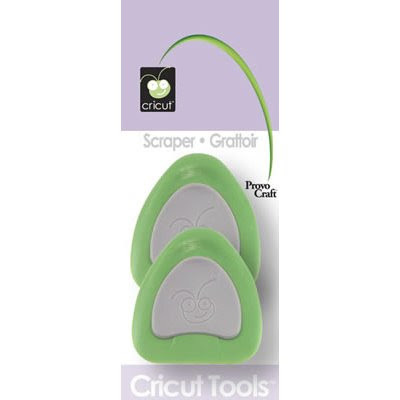 and the spatula ($5.99) OR wait for a sale on Cricut accessories and get the tool kit then. It is really hard to use the Cricut without the scraper, at a minimum. If you have a scraper from Pampered Chef and their stoneware baking sheets, that works also. You will also need a package of mats because they do wear out. BUT, only buy one package, as you can always resticky them by either washing them and letting them dry OR wiping them down with a baby wipe and letting them dry. If that doesn't appeal to you, you can use the quilt re-positioning spray from Joann's. Cricut also made the Jukebox, above, which will hold six cartridges so that you have access to more than one cartridge at a time. You can also link up to three Jukeboxes, thus having immediate access to 18 cartridges at once. It retails for $90 but was as low as $50 at Michael's this past weekend. Now, what if you want your letters to be welded together, like cursive writing? Cricut created the Design Studio, which allows you to weld your letters together and see a screen where you can modify your text or shape in any direction to get the cut you want. "What you see on the screen is what you get". The Design Studio retails for $90 and hooks to your computer by using a USB cord (A/B style - one end flat head, one end square head - not included). It only works on WINDOWS machines. Although the design studio claims to have all the Cricut shapes in its software, you may only actually CUT OUT those that correspond to the cartridges you already own. There are some excellent tutorials and info on the Design Studio on the cricut.com site. Many people have used the Design Studio to create those shaped word books where each letter staggers into the next (see photo below). Cricut also allows you to download a free trial of the software to check it out - Free Design Studio Trial. I love to scrapbook and bought the smaller standard cricut. For what I will use it for, I feel like it will suit me well with the size of it and size of cutting. My sister got the expression. I do not want to regret getting the smaller machine. Any advice or experience between the two? I figured if I needed the larger one, I could just go to her house and for all other uses, I have my own more compact one. Super! I have had a brows around your site. The videos were really informative and encouraging. I've just bought a Cricut Expression and am already pleased with what it can do. Now I am also inspired! Keep up the good work. Can anyone tell me if I have the Design Studio, Jukebox & then bought the Gypsy, do they all do different things that I would need all of them? I have not opened my Jukebox or Design Studio so I could resell them & buy the Gypsy but wasn't sure if they were all necessary for different things. Where can I buy the cable to connect for SCAL? It's come with the Cricut one, but not with the other if it is a download, right? 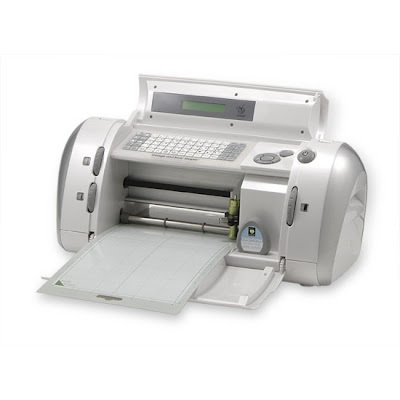 Can you please tell me the difference between a Cricut Expression Personal Electronic Cutting Machine and a Cricut Expression Die Cut Machine? What is the difference between them or are they the same machine? They are differently priced! Great job of explaining the differences in the Cricut products. I have the Expression and love it. It is a little bulky to take to a scrap but I found a canvas tool box on wheels at one of those import tool stores. 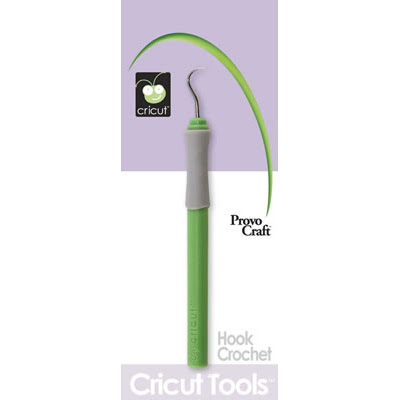 It looks just like the ones they sell for Cricut but mine is drab green which I can live with since mime only set me back $15! The Expression fits into it perfectly. I also have Design Studio and SCAL. Design Studio is great for combining designs from any cartridges that you have - font from one cart plus design from other carts - weld, flip, etc. But I'll never have to buy another font again with SCAL. I was at a scrap and a friend was scraping a page about a library that looked like the one from the Harry Potter movies. No problem, I downloaded a Harry Potter font and cut the letters she wanted!! Cutting fonts is really easy - you just select any true type font on your PC, type the word/letters and size them to the size you need. I must say that having Design Studio and SCAL on a laptop with wireless access is the greatest. I'm just beginning to learn to use SCAL but there are lots of website tutorials out there. I was able to trace the Gators logo and cut it for my son's scrapbook. You may also want to download Inkscape, a free program that allows you to create svg files which can also be imported into SCAL. Cable - the cable is a printer cable with USB on one end and the "new" squarish printer connection on the other. You should be able to purchase a cable at most computer supply retailers. Where do I buy the cable to connect the cricut in order to use SCAL? I think she is describing a cable for a printer??? I don't have one (design studio) but that's what it sounds like to me.....can pick one up in the electronic section at Wal-Mart. You just need a regular USB cable to connect the Cricut to your computer! Thank you! I have the basic cricut and am thinking of upgrading to the expressions and with your explanations i know all the differece. Love the information. Love my gypsy too!! My name is Kristy Allard I was browsing internet and found your blog. The author did a great job. I will subscribe to your RSS feeds. Thank you for your contribution. I am a web designer myself. And here some examples of the websites that I designed for cash advance payday loans online company. 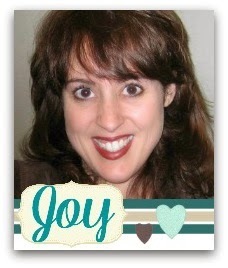 love your webpage all the info is invaluable for me and daughters as we're newbies to cricut and scrapbooking. Thanks for the detailed review of all the cricut machines and all their differences! I love your blog - keep on posting! The smaller cricket is more portable and I haul it around to all of my scrabooking friends homes on weekends. The bigger expression is not really great for carrying around so I just stick with the smaller one most of the time. Hi I have the small bug too but love it and it suits my needs - thanks for the info as I love using Bazill mainly. Your site really ROCKS, just love it, has helped me understand a lot about the cricut, as I just purchased an expression, and am having problems using/understanding it. don't want to sound ignorant but i have a question. Actually i was cleaning thru favorites & ended up here, reading all the comments. Have had Create 3 yrs & just got (well not till Christmas!) Expression...but i keep seeing this word: SCAL....what is that? Hi, I tried all the links for the regular Cricut (intro, advanced, forgot the other one...oops). All of them have the same video...an introduction to the paper dolls cartridge. Do you have another area with videos on the topics you listed?? Many, many thanks!!! I just think you are so AMAZING to share so much info --- what a help and an inspiration! I just came across this post, I've been looking for the difference between all the cricuts because I have the older one, and was thinking about investing in the newer one, well since the older one is my mom's and i'll be moving out soon, so I can't take hers with me, well I could, but I wouldn't do that.. So anyways, it was very informative, and every where else the information was not what I was looking for.. so THANKS!! I havean expression and a gypsy and I love them. Right now I see that the expression 2 is on sale. Is it beneficial to buy the 2? Can you put the imagine cartridges on the gypsy? do any of these machines cut fabric as well? How do you use the jute box?? I was given one but no instructions!! Help! !